BIOGRAPHY For More Information or to Book Your Event, Contact Us! Pittsburgh’s Don Obusek is one of the country’s top Elvis entertainers, with over twenty-five years of experience in the music field. In 1994, Don was the winner of several talent contests, and in 1995, he introduced his tribute to “THE MAGIC OF ELVIS.” In 2001 he was voted "The Best Elvis in Pittsburgh" by WQED's "On Q Magazine." His popular high energy tribute show has been seen in seventeen states and Niagara Falls, Canada and features songs from the 50’s, 60’s and 70’s. Don is a first-class performer who provides quality, Vegas-style entertainment. 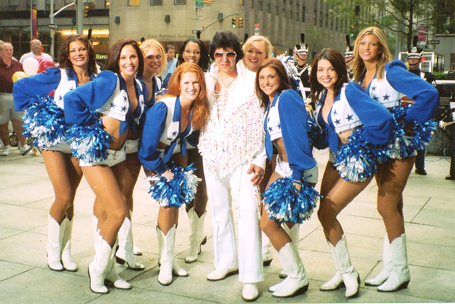 His outfits are spectacular replicas of the ones worn by Elvis and are custom-made for him by B & K Enterprises. During his shows he interacts well with his audience, singing to guests, shaking their hands and giving scarves to the ladies. Don is a powerful and dynamic entertainer who has thrilled thousands of Elvis fans of all ages and lifestyles. He has performed at countless venues and has entertained a diverse audience ranging from small, private parties with 10 guests, to events such as an oldies concert at Pittsburgh’s Three Rivers Stadium, with 29,000 people in attendance. Don is extremely personable and adds his own charisma to the show. He has a strong reputation for excellence and his professionalism is second to none. Many of his engagements are repeat performances. Read testimonials about some of his past appearances. In 1994, 3WS, a local Pittsburgh radio station, sponsored several singing contests. Don entered the contests, sang several “Elvis” songs, and won. This was the start of Don’s “Elvis” career and also the start of an amicable working relationship with 3WS Radio. In 1997, 3WS and DeBolt Travel presented Don and his family the opportunity to be their guests and accompany them to Graceland on the twentieth anniversary of Elvis’s death. The tour buses stopped at a mall in Kentucky, for a quick performance in the food court. (Those of you on the bus tour will certainly remember THAT story!) Later, Don provided superb entertainment for three busloads of Pittsburgh fans, as well as thousands of fans throughout Memphis. Surrounded by loving Elvis fans, Don gave a stellar performance at Graceland Plaza. Portions of this show were broadcast live back to Pittsburgh. Don has also made appearances at other 3WS functions, including several shows at Star Lake Amphitheater. Go to past performances to see a partial list of his appearances.